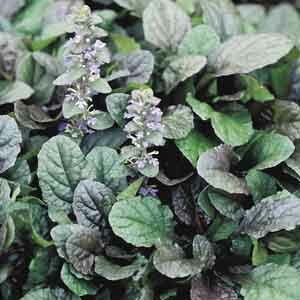 Ajuga is a quick-spreading, thick leaved groundcover suited to sunny or shady gardens. A multitude of varieties allows for the choice of green, purple or multi-hued foliage. All varieties have the added bonus of petite stalks of flowers early in the season. A reliable groundcover for any location. Perfectly sized for rock gardens and border fronts. Effective under trees where lawn has difficulty establishing. Very easy to grow in virtually any location. Plant in ordinary, well-drained soil. Water as needed to keep soil evenly moist, especially in hot weather.